Meanwhile, you can still create your own legend by incorporating the power of a new chain saw. However, you'll want to choose the right saw for the job. Whether for residential use or commercial use, there's a saw that's right for everyone. Take a look at the chart below, then read on to learn more about each type! 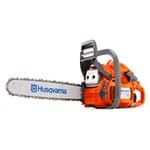 If you'll be sawing regularly or plan to cut substantial trees, get a gas-powered chain saw. Ranging from 12-24 inches, these saws can take on jobs that less powerful saws cannot. However, these saws are heavier and require more strength to use, so make sure you can manage the saw you choose. If you're cutting smaller trees or will only be using your saw occasionally, an electric chain saw is a good choice. 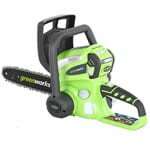 The biggest benefit of electric chainsaws is the motor requires no real maintenance. Just turn it on and go. 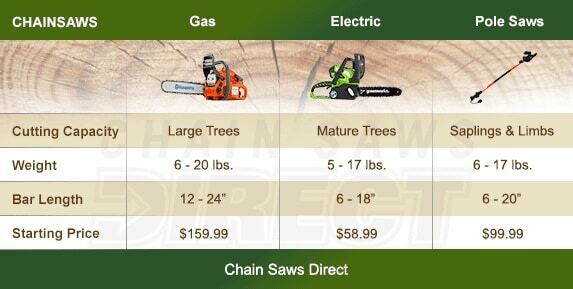 If you want to fell large trees or cut hard woods, a gas chainsaw is a better choice. 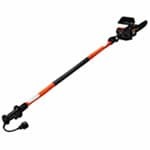 If you're primarily pruning pesky branches and removing low-hanging tree limbs, then you'll want a pole saw. Essentially, it's a miniature chain saw on an extendable shaft. A pole saw provides you the safest way of trimming hard to reach tree branches. You can extend the pole up to 15 feet so you don't have to cut from a rickety ladder. These saws are small and are not meant to take on large jobs. Chainsaw Buyer's Guide.. Our Power Equipment Direct how-to library can help you learn about Tips for Starting Your Gas or Electric Chainsaw, Benefits of Corded and Cordless Chainsaws and Proposition 65 Product Labeling.